Designing and making beautiful cutlery from sterling silver and locally sourced English Holly, Charlotte creates functional pieces of art for the kitchen. Her ethos revolves around simple, elegant designs that are ergonomic and tactile. With the intention of provoking people to appreciate their food and take time over their daily routines and rituals in the kitchen. Preserving and capturing the natural qualities of the materials used. Charlotte creates magical utensils with a rugged, native feel to them. Her pieces are designed to function, with appreciation towards the natural beauty and proportion between the materials. Immersing herself in the creative process: a wonderful journey from beginning to end, gathering and foraging for branches that fit the designs by jumping through hedgerows and stomping around woods. 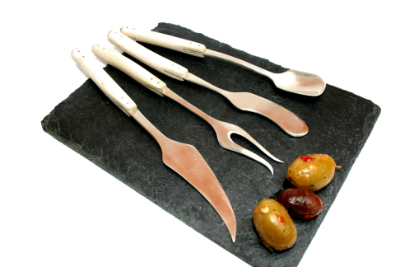 The cutlery is made from sterling silver for its robust qualities. Holly is a hard, durable wood, coupling beautifully with the silver. The wood is treated with a food safe wax to help protect against staining. Using traditional techniques of forging and raising to create pieces, with a need of understanding the materials to get the best outcome. Her work has fine details and is finished to a high standard. Hallmarked in accordance to the Assay Office's rules and regulations. Hallmarked in London.